A floral palette of soft creams and burnt oranges represents the transition from late summer to early fall. The Regencystyle table is from Theodore Alexander. Floral designer Ariel Dearie shares her vision of luxury through an artful assembly of nature’s freshest offerings. Cut flowers have long been a symbol of opulence: It is believed that ancient Egyptians decorated their homes with blossoms, and Greeks and Romans tossed petals onto floors and beds for special occasions. Such indulgences speak to the power of fresh blooms as a lavish addition to any setting. 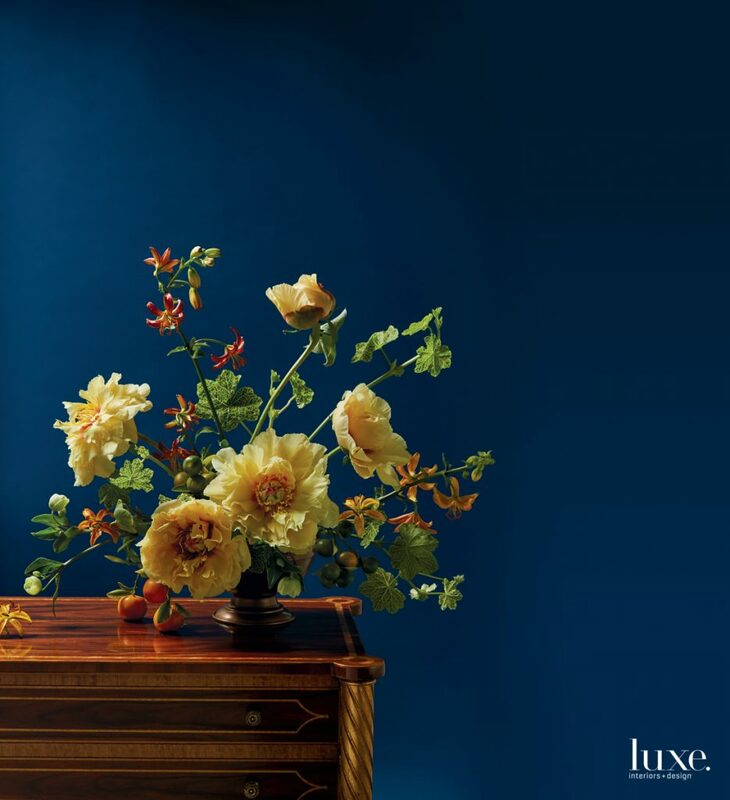 “Flowers have such fleeting beauty–to me, there’s nothing more luxurious than using elements that are the most exquisite in the moment,” says floral designer Ariel Dearie. For the arrangement seen here, intricate tree peonies, plucked at their peak, take the lead, while variegated geranium, mini lilies and kumquats play supporting parts. “When I design, I want the arrangements to feel full, yet airy and whimsical, so negative space plays a big role,” says Dearie. Indeed, one of her signature moves is to let the blooms show a little leg–the stems become part of the arrangement. The effect is lush, yet deliberate and understated. “Quite often with flower arranging, less really is more,” she says.